Vernier Chemistry Investigations for Use with AP* Chemistry lab book provides a comprehensive set of resources for the AP Chemistry teacher, including sample data, sample analysis and calculations, and helpful guides to assist in preparing reagents and chemical solutions. In addition, a carefully chosen set of step-by-step instructions for operating probes and software is included to help students make the best use of available lab time, while retaining the spirit of an inquiry environment. Complete student preliminary activities with step-by-step instructions, data tables, and questions. Teacher Information section for each investigation with complete directions for setting up, helpful hints, and sample graphs and data. Word-processing files of the student sections on a CD so that any investigation may be easily edited to specifications (Microsoft® Word® files). 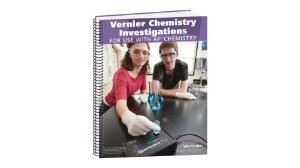 Features listed above are only available when purchasing the lab book. The downloadable evaluation PDFs include student instructions only.